If you live in a condo then you know that it has a gym as part of your condo’s amenities, and chances are you don’t use it. You’re not alone. Despite having their own fitness game plan and free indoor workout area, most condo dwellers still don’t really pay much attention to it. It’s a nice thing to see when you were deciding to purchase the condo, but that’s about where your, and most other owners’, appreciation of it ends. This isn’t anything new though. Lack of exercise is now a global pandemic. People just don’t exercise. There are so many positive benefits of exercise and yet a lot of us don’t really put the time in to stay healthy. But despite all the benefits, why is it that most people shy away from exercise? This differs from person to person but generally most people just don’t feel they have the time to workout. With their jobs and other responsibilities, they find it difficult to squeeze in an hour or two to exercise. By far the “I’m too busy” excuse is the most common. The list of excuses is very long and the more people you ask the longer it’ll become. Most of these excuses can be resolved very easily if you have a real desire to exercise. It’s actually even easier for people who have a condo gym because you have all the basic equipment already there. All you need to do is to use them. But even if you don’t have a free condo gym, or if you just don’t like to use it for one reason or another, it’s still very possible for you to workout inside your condo. You don’t even need to buy expensive gear or weights to start exercising. All you need is a little space, the furniture that you already have inside your condo, the list of exercises below, and a firm resolution to exercise regularly. Before we get to the list, you need to understand that what you’ll be mostly working with is your bodyweight. For beginners, this is ideal. Body weight workouts won’t cost you anything because you don’t need to buy equipment to do them. 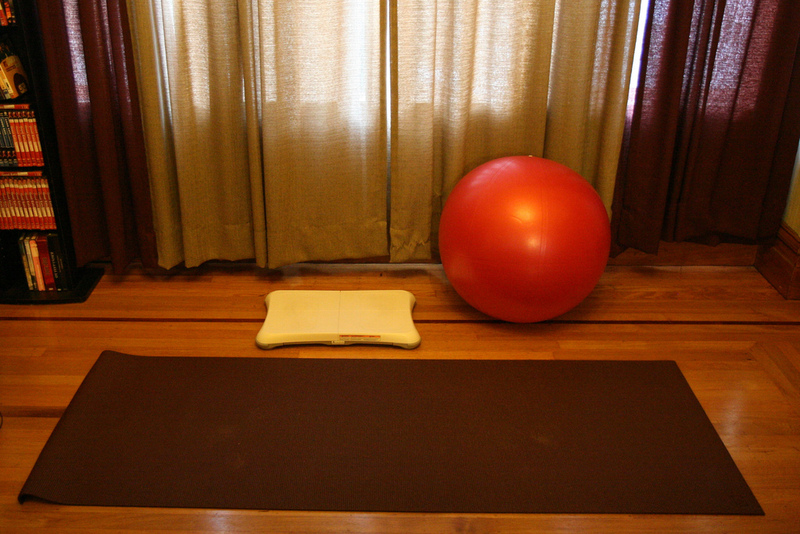 You can get a yoga mat or an exercise ball if you want, but they’re not really necessary. They’re just nice to have. Most of the drills are easy enough to do that you don’t really need a coach to watch over you; and they can also be tweaked to become difficult enough to really challenge you even if you’ve been doing them for a long time already. Another consideration we had when coming up with this basic list of exercises you can try in your condo is that it had to be holistic. Meaning it should contain workouts for all your major muscle groups. This way you’ll be able to gain general functional strength as opposed to something very specific. Athletes normally prioritize specific muscle groups more than others because of the nature of the sport they’re involved in. But for most people, a balanced program where all major muscle groups are strengthened equally is ideal. Now that we’ve gotten the preliminary stuff out of the way, it’s finally time for the drills. Most of you will probably have already heard, seen, or done most of these things in one variation or another. They’re popular for a reason, they work. But they can also be scaled to higher intensities so if you find some of these too easy, then you might want to try the harder variations. You also don’t need to do all of them in one workout session. If you don’t have the time, you can do just one or two. Say you only have 15 minutes in your super busy schedule, then just do 50 pushups and squats in the morning before you leave and you’re done. If you have even less time just do 30 of each. What’s important is that you do them. So here’s the list of great body-weight exercises tips you can do inside your condo. You’ve probably done this already or at the very least seen some people do them. Jumping jacks are easy to do, don’t need a large amount of space, and is a great way to start your workout. They’re a great warm up to get your blood flowing and your muscles ready for the drills to follow. This is primarily done as a warm-up so they won’t strain your muscles too much and you’ll be doing a lot of reps. Try doing 30 per set and do about 3 sets (total of 90 reps). If you can do 50 reps per set that would be awesome. Push-ups are very easy to learn but challenging to do. They’re a mainstay in any home exercise program because of the muscle groups they target and ease of execution. There are also so many variations of push-ups that regardless of what fitness level you’re at, they can always be challenging.The best thing about them however is that they can be done anytime, anywhere. You can do this on the floor, against your bed, in the sala, or even along your condo hallway if you don’t think your neighbors will mind. If you’re having trouble doing pushups on the floor, you can try doing them at an angle to start. So you can use the edge of your bed or a ledge to push off from. Doing push-ups at an angle takes off a bit of the weight away so it becomes easier. Proper form still has to be followed though. Experiment on how high an angle you want to do. The higher the angle from the floor (the more upright you get) the easier it becomes. Try not to make it too easy though. On the other hand, if you’re a bit more experienced and have built up your strength already, these variations from mens health should be able to challenge you regardless of what level you’re at. Try doing 3 sets of 10 reps each for these regardless of the variation you’re doing for a total of 30 reps. If you find this too easy then just add more sets or add more reps per set as you see fit. Some people might have painful memories of this because it was (and probably still is) commonly used as a punishment in some households and schools back in the day. But the fact that it’s difficult enough to do for it to become a punishment is actually testament to how effective it can be when utilized correctly as a drill. The squat is a great lower body exercise because just like the push up, you can do it pretty much anywhere. It’s also a very functional move and involves lower body muscles that we’ve actively been using our whole lives. So most people should benefit a lot from this exercise. How do you do a squat? Watch this video. This workout is great for people who are looking to tone their arms. It’s easy to do and you can use pretty much anything that has a stable horizontal surface that you can lean on. Tables, beds, and obviously benches are great for this. A chair with a stable hand holder or support will also work. The video also teaches you how to do this a little harder so if you feel that you have decent strength in your triceps already, then you can try level 3 to see if that’ll give you more of a challenge. This is another predominantly cardio exercise much like the jumping jacks. It’s great for getting your heart rate up but it’s also a good exercise for your lower body. You can start on a really low bench like in the video because that’ll make it easier. If you’re capable of performing these with no problems flat on the ground though that’s even better. Lunges are great for your legs, easy to do, but very challenging as well. You’ll really feel the burn with these especially if you’re not used to leg workouts. Lunges and squats are your mainstay lower body workouts. Inside the gym you can increase the intensity of these same workouts by carrying weights. But even with just your bodyweight alone they are plenty challenging already. If you have a bit of space in your condo you can do walking lunges. Basic form is the same, except instead of pushing yourself back to your original position, push yourself upright and step your other foot forward. It looks like a very exaggerated walk. Remember to keep the form. Take large strides and don’t let your knees go beyond your toes. As we all know, the benefits of condo walk are numerous and all vital – from simple brain relaxation upto improving one’s daily life. Here’s another one for the glutes. Easy to do and is an amazing exercise for your buttocks. Might feel a tad weird initially when you’re doing, but you’re inside your condo doing these so what the hell right? These are best done on the floor. You can do them in your bed but it’s not going to be as good unless you have a really hard one. You can place a yoga mat or a large towel beneath you if you want but doing them on just your bare floor is fine as well. Now we go to a really important muscle group but one that most people hate to workout, the core muscles. These are the muscles in the middle part of your body. You use your core muscle for a lot of mundane movements like your normal motions when cleaning the house. They’re also very important in sports and in any activity that involves good balance. The Plank is a great workout that hits all the core muscles. It’s easy to get the form but very difficult to maintain even for those with experience. And since you’ve already learned how to do a pushup, you won’t have any problems learning how to do this one. You all probably already know how to do crunches so lets skip that in this guide (but still do them at home though). Let’s try a reverse crunches which are great for the lower ab. Incorporating this into your ab workouts will add a little more variety and make them a lot less boring. Our final exercise for this article. This is another ab workout which is easy to do but challenging still. Since the reverse crunch was mostly for your lower ab, this one will work your upper ab muscles. So there you go, 9 great body-weight exercises that you can do at home. No need for extra equipment, you just need yourself and the motivation to get fit. Try to set aside 30 minutes to 45 minutes at least 3 or 4 times a week if you want to do these. Then work your way towards doing them everyday once they become easy. Keep in mind that there’s no magic number for how many you should be doing of each. The one’s listed above are just guides and you can do more or less depending on your ability. Try to really push yourself though, without sacrificing form of course. Ideally you’ll want to workout in the morning so that you can get your workout as early as possible and then go on with your day. But any other time of the day that you’re most free is fine as well. What’s important is that you do keep doing them and that you stay motivated. These will be difficult at first but they’ll become easier. Stay healthy and keep exercising.